Affino has taken GDPR wholly and whole-heartedly onboard. Meaning that GDPR is baked into the very core of the system and covering all user management and communications is a singular integrated system fully setup and part of all those customer activities - where Affino admins need merely configure the system profiles to make use of it. We have concertedly are bringing every aspect of GDPR into the core system - giving Affino service users the ability to be fully compliant with the application of the GDPR laws across the board. We also give you best practice guidelines, help guides and checklists. ’The Key Constituent Components’ section below details Affino’s comprehensive GDRP Management. Of course you will still need a Data Protection Officer along with all the correct processes and procedures, and the mechanics of GDPR are baked into Affino to drive compliance across all parts of the business that use it. This means an extensive system of preference and permission management, as well as functions which allow accounts and communications to be easily suspended and personal data elegantly and quickly extracted, or removed where appropriate, upon request. Since Affino can be used to fully manage and deliver on the audience engagement from the core CRM through to all the front end audience engagement, it can capture more audience interactions and extend the length of the contact records in a way that is hard to match. Media Download Permissioning - optional permission capture for downloads both for audit and contact list capture via white paper downloads etc. User Import - Affino flags when a contact exists in the secure archive when attempting to re-import them. It is necessary to un-archive them first. The Affino Unified Digital Business Platform is wholly different from any other digital business solution out there - it just covers many more customer activities within a single seamless system. 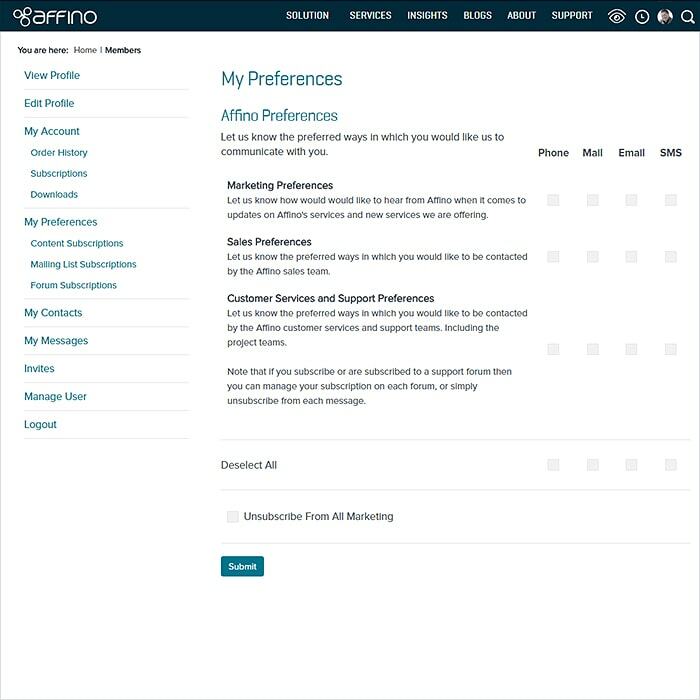 Affino is already fully integrated across CRM, Commerce, Community, Events and Communications - no other comparable system handles so many activities in a fully inclusive manner. GDPR is now just another of Affino's Core Activities - fully baked into the core of the system and pervasively applied to all and every part of the system. This makes for unprecedented ease of GDPR compliance as everything you need is already on-hand and fully connected with all parts of the system. You simply need to configure and setup the system to your own requirements - you still need to do some work, but as a Data Protection Officer, the lion's share of the heavy lifting is done for you in system terms. You will always need to write your various policy and privacy documents and set up preference profiles - but the whole framework is there for you to make use of directly. For those not on Affino they will need to contend with multiple disparate systems often with multiple different databases - all of which require full documentation and permissioning with total transparency and portability between different parts of the interconnected system. User data, along with the relevant permissions and preferences then either need to be integrated via API across these platforms or alternatively imported / exported (with high frequency) between systems, or worst case manually managed within each system. The more you use Affino to manage and deliver your business services, the more you can make all these essential processes and procedures more streamlined, more comprehensive, more compliant and easier to manage in the long run. Unfortunately most comparative systems to Affino are still overly fragmented and rely on several third party solutions to manage and deliver on different business activities - they need to stitch together different permissions formats and standard and try to somehow meld them into a unified whole - while Affino does it out of the box. 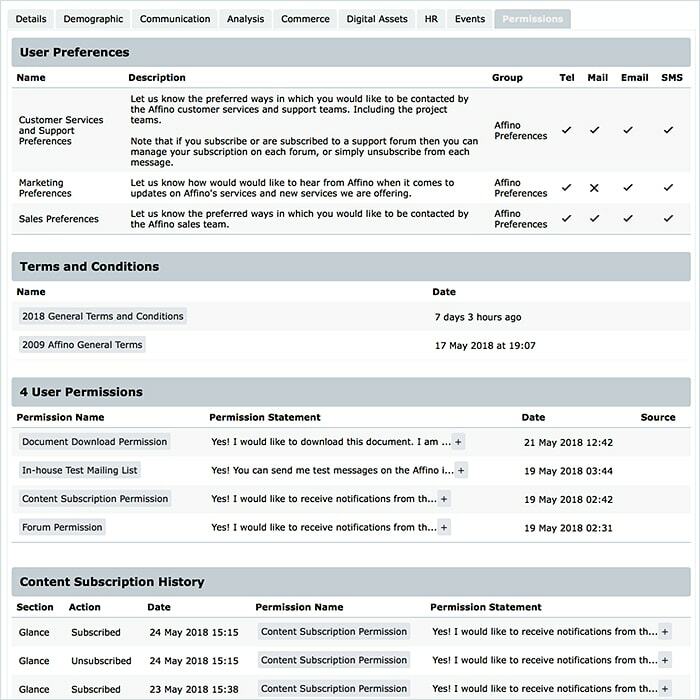 Affino's single core central CRM approach - means that all policies and permissions can be applied universally. The more diverse and different databases you have the more difficult it is to manage GDPR to the full letter of the law without such centralisation. Affino is singular in the number of systems which have everything baked in for relatively easy deployment and rapid and dynamic customer and GDPR Management. 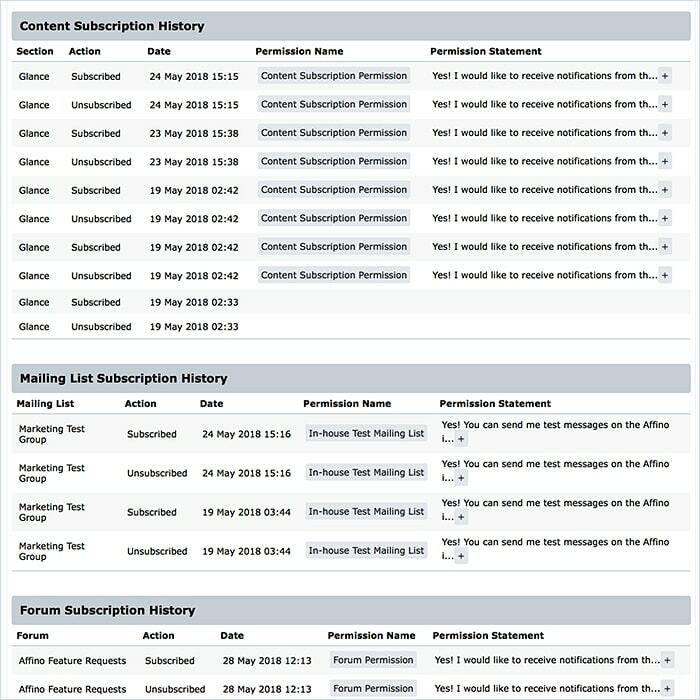 GDPR is fully and wholly deployed on this Affino.com website - if you wish to experience some of the key elements of it, we would encourage you to register and review those workflows.